On October 12th, 2018, Sub Pop will reissue The Helio Sequence’s landmark album Keep Your Eyes Ahead for its 10th anniversary as a deluxe edition.The newly remastered set will be available on CD/2xLP/DL and includes the original 10-song effort along with a second album of demos, alternate versions, and outtakes from the same era. Keep Your Eyes Ahead: Deluxe Edition was mastered by The Helio Sequence at Helio Sound studio in their hometown of Portland, Oregon. You can listen to “Lately” and an acoustic version of “No Regrets” and pre-order the record today. LP preorders of Keep Your Eyes Ahead: Deluxe Edition through Sub Pop and select independent retailers will receive the Loser edition on blue vinyl. There will also be a new t-shirt available at this time. 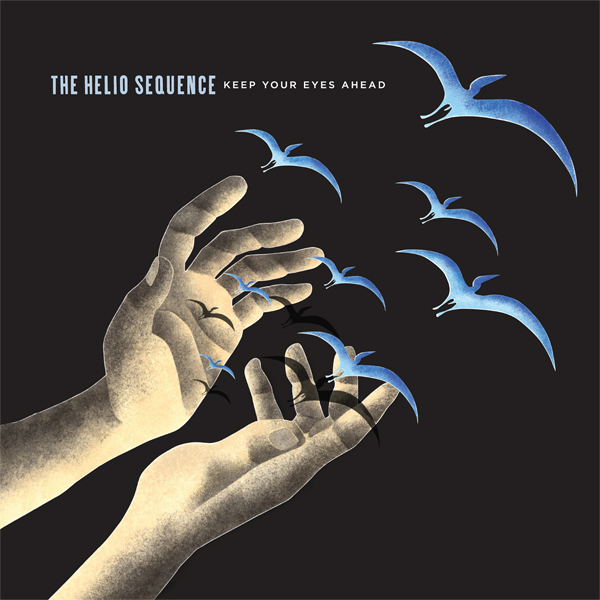 The Helio Sequence will celebrate the 10th anniversary of Keep Your Eyes Ahead playing the album in its entirety on tour, beginning November 14th in San Francisco at the Chapel and ending December 14th in Portland at the Doug Fir. Tickets for these dates are on sale now. Preceding the tour, the band will appear at McMinnville, Oregon’s Walnut City Music Festival on September 1st, and Rainier Day along Airport Way in Seattle’s Georgetown neighborhood on October 6th. For more information on tickets please visit https://www.heliosequence.com. Now available for your eyes and ears: The Helio Sequence’s official video for “Battle Lines”, from their self-titled 6th effort, directed by Robin Washburn and featuring animation from Emanuelle Kabu (“Upward Mobility”). The Helio Sequence is out now on CD/LP/DL worldwide from Sub Pop, and you can spend your hard earned dollars (or your allowance) on it via Sub Pop Mega Mart, iTunes, Amazon and Bandcamp. Everyone who purchases the LP from megamart.subpop.com will receive the limited “Loser Edition” on yellow-colored vinyl. The band’s U.S. west coast tour resumes Saturday, July 11th in Seattle, WA at The Neptune and currently ends October 1st in Spokane, WA at INB Performing Arts Center. Additionally the band have added an appearance at Victoria, BC’s Rifflandia Festival on September 19th. The Helio Sequence is out now on CD/LP/DL worldwide and can be purcahsed in fine record stores near you as well as online retailers such as Sub Pop Mega Mart, iTunes, Amazon and Bandcamp. Worth noting, however, is that while supplies last, customers who purchase the LP version of the album from megamart.subpop.com will receive the limited “Loser Edition” on yellow-colored vinyl. Additionally, The Helio Sequence’s US tour will resume on June 3rd in Boise, ID at Neurolux and will run through October 1st in Spokane, WA at INB Performing Arts Center. The Helio Sequence will be direct support for Death Cab For Cutie on Sep. 30th & Oct. 1st . Get the complete list of tour dates below. The Helio Sequence are set to release their self-titled 6th album on CD/LP/DL May 18th & 19th worldwide via Sub Pop. The Helio Sequence, featuring the highlights “Stoic Resemblance,” “Upward Mobility,” and “Battle Lines,” was produced & mixed by the band at The Old Jantzen Building in Portland, OR and mastered by Greg Calbi at Sterling Sound. The Helio Sequence will tour extensively in 2015 to support the release. Preceding that tour, the band have scheduled an acoustic performance on March 31st in Seattle at The Triple Door. For up to date information on live dates & tickets, please visit http://www.theheliosequence.com. Preorders for The Helio Sequence are available through Sub Pop Mega Mart, iTunes, Amazon and Bandcamp. All customers who pre-order the LP version of the album from megamart.subpop.com will receive the limited “Loser Edition” on yellow-colored vinyl. Additionally, CD and LP versions of The Helio Sequence will also receive The Sunrise Demos, a CD comprised of 11 demos recorded during the making of the album (while supplies last). Additionally, there will be a new T-shirt design available as stand-alone item or as part of a bundle with purchases of The Helio Sequence. The self-titled sixth album by The Helio Sequence began with a friendly competition. Several of the duo’s friends within the Portland, Oregon music scene had been playing “The 20-Song Game.” The rules were simple, playful and ambitious: Songwriters would arrive in their studios at prearranged times and spend all day recording 20 complete songs. When they were finished, they’d have a party, listen to the results and talk about the process—of taking the good with the bad, of letting creativity push past constraint, of simply making music in the moment. Brandon Summers and Benjamin Weikel took the spirit of the “The 20-Song Game” to heart, and forged ahead writing a new record. In May of 2014, inspired by the “20-Song Game”, they began arriving each morning in their Portland space—housed in the cafeteria and break room of an old warehouse— with the mission of making as much music as possible in one month. They began exploring and capturing, recording guitar riffs and keyboard loops, drum patterns and bass lines. One piece documented, they quickly advanced to the next idea. Summers and Weikel didn’t discuss what they were making or the reference points that informed it, though such discussions had once been central to The Helio Sequence’s more self-conscious process. They just played. Created. In time, they returned to each fragment, broadcasting it over the studio PA, jamming and recording the results. Mistakes didn’t matter, and second chances didn’t exist. After two weeks, Summers and Weikel began cutting those loose takes into rough shapes, steadily building songs from their cavalier sketches. When June arrived, the duo gathered their 26 finished songs and sent them to 31 friends, fans and family members. They asked each person to rank their 10 favorite tracks. By summer’s end, they had arrived at the brisk 10 tracks that shape the breathless and magnetic The Helio Sequence—a record so named because it’s a kind of clean restart for the longtime pair, a revamp of their process and a revitalization of their results. The Helio Sequence is a renewed push forward for the band: From the cool wallop of “Deuces,” where guitars snarl and harmonies soar, to the stuttering anxiety of “Upward Mobility”, where pianos pound and drums race, this collection depends upon an effortless kinetic energy. Lyrically, “Stoic Resemblance” is a study of existential anxiety, but musically, it’s a beguiling burst of pop, Summers’ vocals rising over and sliding off of Weikel’s big, irrepressible beat. The bittersweet “Leave or Be Yours” evokes the easy twinkle of romance and the smoldering sadness of losing it. Crisscrossing vocals and cross-talking guitars and drums map a broad swirl of emotions. There’s a delightful candor to The Helio Sequence, an openness that is a rare and special feat for a band about to enter its third decade (read more at Sub Pop). A madness of the Soccer—or if you prefer, futbol—variety has taken the city of Seattle in pandemic proportions since the 2007 inclusion of the Seattle Sounders FC to the Professional Soccer Society of American Gentlemen (MLS). During the soccer season, everywhere you turn in Seattle, you find yourself surrounded well-educated hooligans, who likely work in the tech industry, wrapped in blue and green-striped scarves chanting indecipherable nonsense in unison and ordering a plain ol’ donut without the Sounders’ colors sprinkled on it becomes a nearly impossible task. Today, we at Sub Pop are helping to stoke that intense fervor by putting one of our most exciting bands, The Helio Sequence, in front of thousands upon thousands of Seattle Sounders fans near the stadium as the band leads the crowd in the “March to the Match” where the Sounders will play West Coast rivals the L.A. Galaxy. If you don’t have tickets to the game, but you do want to see The Helio Sequence play a free show, head down to Century Link field and see them play in the parking lot at 4:20 today (let’s save the weed jokes for a different blog post, please). More info on the location here. Come for the The Helio Sequence, stay for the Sounders. It’s been a very lengthy stretch since The Helio Sequence released their 2008 breakthrough masterpiece, Keep Your Eyes Ahead, long enough in fact, that we’ve been made to feel like we’ve been festering in a rank puddle of anticipation being forced to cruelly wait for what would assuredly be an amazing follow up. With 2012 well upon us, all of that impatient waiting that we’ve been complaining about here at Sub Pop HQ is about to be over! On September 11th, The Helio Sequence’s long-awaited fourth album, Negotiations, will finally be available on CD and double LP (pressed at 45 RPM for maximum fidelity, by the way. )!